Today we begin with the facts. But not just the facts; the facts of the facts. We want to better understand just what it is that is provoking today’s ludicrous world. To clarify, we are not after the cold hard facts; those with no opinions, like the commutative property of addition. Rather, we are after the warm squishy facts; the type of facts that depend on what the meaning of ‘is’ is. The facts, as far as we can tell, are that we are presently living in a land of extreme confusion. The genesis of this extreme confusion is today’s fake money system. And the destructive effects of this fake money system have spread out like a virus into nearly all aspects of daily life. Plain and simple, central bank fiat money creation, multiplied by commercial banks through fractional-reserve banking, propagates financial and economic chaos. The experience of long periods of money supply expansion punctuated by abrupt, episodic contractions, has the effect of whipsawing the working stiff’s efforts to get ahead. This trifecta of offenses has debased the rewards of hard work, saving money, and paying one’s way. Quite frankly, these facts are insulting. In particular, they are insulting for those running in the rat race for their family’s daily bread. These facts are also insulting for retirees, who worked for four decades only to have their life savings extracted by the depredations of the fake money system. The facts are that the seeds of Nixon’s default were sown years before with LBJ’s program of guns and butter. Nixon merely brought the default to harvest. Moreover, since Nixon’s default there has been near unrestricted growth of debt based money. The facts are that over the last half-century the world has constructed a magnificent edifice of debt. In fact, according to the Institute for International Finance, global debt in the first quarter of 2018 reached $247 trillion. Moreover, the global debt-to-GDP ratio has exceeded 318 percent. These are facts. What’s more, the facts are that debt – public, corporate, and consumer – has exploded higher over the last decade during an era of extreme monetary intervention. This extreme monetary intervention artificially suppressed interest rates and compelled many short-sighted decisions. One popular short-sighted decision manifests in the corporate financial engineering craze. This is the crude maneuver where corporations borrow money at low interest rates only to pump it into shares of their stock. This effectively inflates share prices and the stock option compensations of corporate executives. But what happens next year when the payment on the debt increases and share prices are cut in half? Who loses their job? The scheming executives? Or the rank and file technician who is downsized into redundancy? Another collection of short-sighted decisions that has piled up like a wreck on the 405 Freeway through west Los Angeles, is the $1.5 trillion student loan debt crisis. At $1.5 trillion, student loan debt, much of which is backed by the government, is the second highest consumer debt category – behind only mortgage debt and higher than both credit cards and auto loans. Now what would happen to all these overpaid university professors and fancy country club style college campuses without all this government sponsored debt? The facts are that the Federal Reserve is currently shrinking its balance sheet and raising the federal funds rate in tandem. All the while, the stock market washes upward as if the liquidity tide were coming in rather than going out. This present convergence of facts, without question, offers a sensation of concentrated suspense. The point is, we are currently facing an abundance of disagreeable facts. Yet, there are no quick fix, wave the magic wand, solutions. These aren’t the sorts of facts that President Trump can correct with a 280 character early morning tweet. But we are not without hope. Remember, the facts are occasionally subject to change. For example, doctors in the Middle Ages all knew that trepanning was the best way to cure epilepsy or migraines. Trepanning, if you’re unfamiliar with this barbaric surgical procedure, consists of drilling a hole into the human skull. Somehow, a hole in the head was supposed to cure a bad headache. By the early 16th century the facts had changed. A hole in the head lost favor as a generally accepted medical procedure for curing a migraine, among other ailments. These days we like to flatter ourselves with our modernity. What could be more civilized than having up to the second stock quotes, the weather from major cities across the globe, and pop culture trivia questions, all simultaneously streamed at you from flat screen monitors while rapidly blasting up to the 50th floor of a glass faced skyscraper? This, you see, is real progress. Yet we drink coffee out of paper cups. We treat cancer with radiation and chemotherapy. And we accept the depredations of a fake money system like an epileptic circa 1400 accepted a hole in the head. These are the facts. Perhaps several centuries from now they will be aptly corrected. which effect both of these markets than a strengthening US Dollar. Today the US trade deficit jumped by the most in three years. So much for declining rapidly! Nice chart on the USD – looks like we’re headed back ip to 100 or higher. Cowboy, an interesting article on the subject. You and I may think it’s fake money but no one else seems to think so. The US dollar is surging and it looks like it is going to destroy both emerging market currencies as well as precious metals. Trump is not going to be happy but there’s nothing he can do about the Fed raising interest rates and dooming US export hopes. We shall soon see the biggest US trade deficits in history! The USD is like a segment of string with two very distinct ends for its application and its utility in trading it into the real economy. Only one end of that segment is the currency, meaning the debt based medium of exchange. 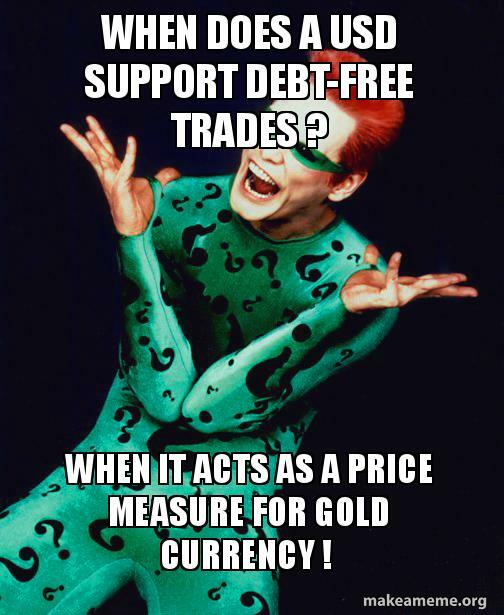 It’s at the other end that we find the floating price tool that now supports debt-free trades in e-commerce transactions, through simple real-time price comparisons. Can you create a string segment that features one end , only ? There are some necessary evils in God’s script, likely for very good reason. USD hegemony has had a purpose that slowly reveals itself like an elephant in the room that very few could see just 10 years ago.